Are your worried about the effects of using toxic flea products on your dog or cat? There's good reason to be worried, according to a recent A & M study, our pets have up to 30 times the chance of getting cancer than their owners and it's no wonder. Your dog is bombarded with everything from monthly cancer causing flea drops to scary chemicals sprayed on our lawns that they lick off their feet and swallow. Add a heavy vaccine load and you've got a pet who could come down with a serious illness years too early in her life. Agatha's Elixir is a key part of keeping your pet healthy. Formulated with a powerhouse of ingredients designed to help your pet detoxify, naturally, support and cleanse the liver (the vital organ that is responsible for ridding the body of all those chemicals safely). How do you help your dog stay healthy? You want to be an educated dog owner - but it’s hard. Your new puppy isn’t eating well or your older dog is starting to ignore her dinner. Or you're worried about the flea products you've used for years, have they already begun to harm your much-loved pet? You find yourself on Google searching page after page for a genuine answer and not just another disposable product. 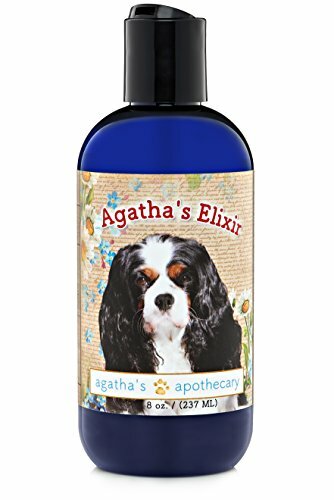 Our popular best-seller for good reason, Agatha's Elixir is a simple daily step you can take to help your dog, whether she's a youngster just starting her journey or a senior dog who you want to support any way you can. Has your dog been exposed to monthly flea and tick products? What about excess vaccines? She can slowly be showing signs of ill health that you blame on her dog food or the pollen in the spring. Food allergies, hot spots, chronic IBS, all signs that her immune system is under stress. The first line of defence is to support her immune system and her liver's ability to rid toxins from her body. Elixir is unlike any product on the market, rich in prebiotics, Elixir supports liver function and cleansing with powerful herbs like milk thistle & nourishing green tea extract. High levels of Vitamin C & B provide immune healing and organic apple cider vinegar, (the highest amounts of this potent tonic) renowned for it's benefits for digestion. Used in conjunction with a potent probiotic like Advanced Probiotic, your pet can not only repair from past damage, but she can heal and thrive, even live years longer because you've given her what she needs to repair. Puppies - For the fussy puppy who needs a little incentive to clean up her kibble, drizzle a half teaspoon, stir and watch her chow down with puppy delight. Mid-Life Dogs - Now is the time to start helping your good dog stay well. You can add years of healthy life by giving your dog the tools to stay well. Senior Dogs - For your elderly Golden Retriever who sniffs her bowl and walks away, a teaspoon full of Agatha’s irresistible Elixir will spice things up and help build appetite with every serving. Safe For Pets Of All Ages - From Dog and Cats To Rabbits and Reptiles. Agatha’s Elixir works naturally - without dangerous high fructose corn syrup., (which has been linked to IBS and sudden disastrous drops in blood sugar). High fructose corn syrup is listed as having "no nutritional value”. Enough said. Order a bottle of Agatha’s Elixir before you bring that new puppy home. Get a bottle of Elixir now, before your elderly dog starts to decline. Help your pet of any age thrive with this health building tonic.